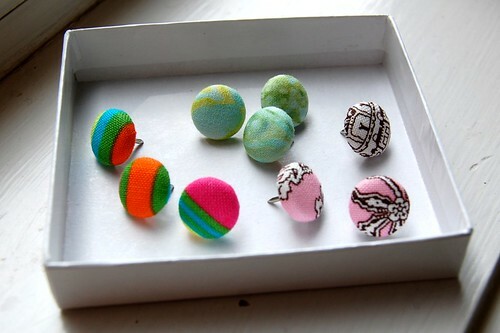 Posted by jeninmaine in bebeh, Crafty, Etsy, sewing. Danger, Will Robinson, danger! The Legend of Zelda: Twilight Princess is a very fun game. Very fun. I love it long time. I stayed up a bit too late playing it the other night and will need to put myself on a very strict LoZ diet so I don’t overdo it. It’s funny – I don’t play a lot of video games any more, and it’s not because I don’t like them. It’s because I do like them, and I like them so much that I will play in completely irresponsible quantities. I’ve been naughty – I’ve wanted to do creative things at night once the kids are in bed and decided to play LoZ “just for a few minutes”, which quickly turns into an hour or more. Need to focus. Game is fun but time is fleeting. I did buy the buttons for Mim’s jumper, I just need an evening where I’m not playing video games when I have the time to get the sewing machine set up to make buttonholes. I figure I’m going to do my sewing all at once so I went ahead and cut out another jumper from this gorgeous batik from the LYS/LQS. Oh, I love it so much. 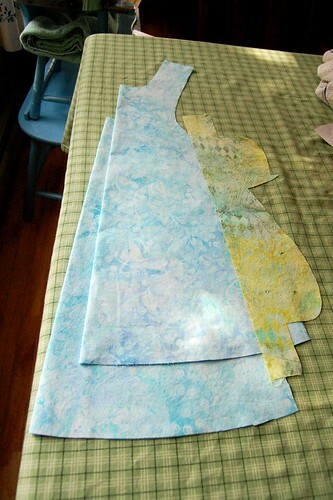 I’m going to use the same green batik for the inside yoke as I did for the first one. Ack, my tablecloth is horrible. Oh well…what do you want for $2 at Goodwill? Since I’m sewing again I once again have lots of scraps. I hate throwing anything away so I try to come up with ways to use as much as I possibly can. Buried in my sewing stuff I unearthed a drawer of button-making stuff, hooray! So I did that. 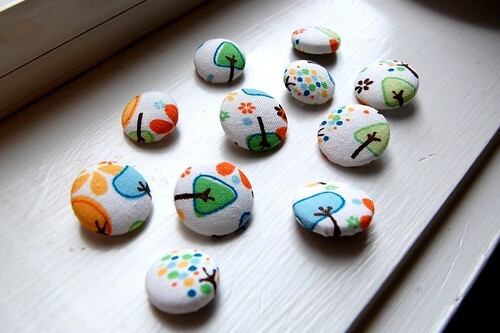 First, some buttons – the trees are 1″ and the batik are 5/8″ and 1/2″. 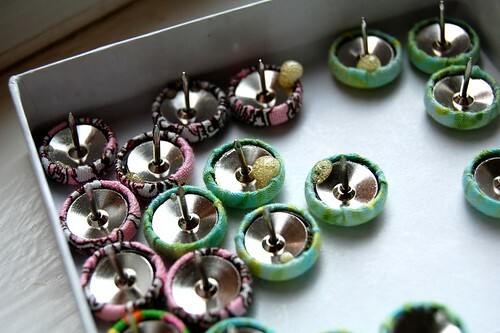 I also used some of the 1/2″ buttons with flat backs to make pretty thumbtacks. I used Gorilla Glue for this batch – normally I use E6000 or Bond 527 but they both have pretty strong fumes so I thought I might try something new. 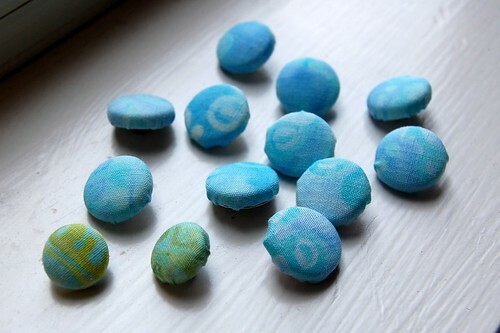 I am loving the fabric covered whatnots, it would be a great way to recycle old clothing, too. I’m always looking for ways to reuse stuff. I’ve started reusing my paper coffee filters – I have a #2 cone filter and it seemed stupid (and expensive) to throw out the unbleached paper filters that I use in it after every cup, so I started just rinsing them out after each use and using the same one throughout the day. I haven’t tried letting it dry out and using it the next day, maybe I’ll do that today. In any case I won’t have to buy filters as often. Two great website links for today! <a href=”https://www.jcarolinecreative.com/&#8221; target=”_blank”>j.caroline creative</a> – just go look. It has the covered button stuff and so, so much more. Love this site. <a href=”http://www.trueup.net/&#8221; target=”_blank”>True Up</a> – everything about fabric, LOVE this blog. Also has a great <a href=”http://www.trueup.net/?cat=143&#8243; target=”_blank”>sale alert section</a>.